Most all tablets these days have just a single screen, large or small. You interact with them in much the same manner; touching the screen. Some have KBs or g-sensors, but generally there's only so many things you can do to a tablet. That limitation is based on the shared design limitation of a single screen. 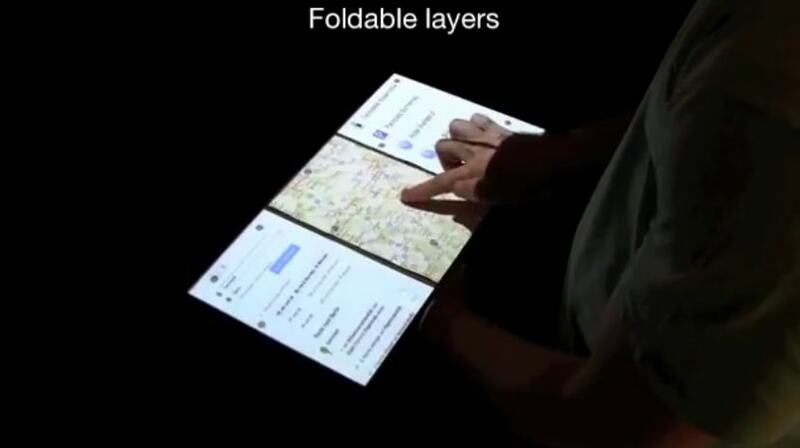 Have you ever considered how you might manipulate a tablet that is built like a book? The video above is an exploration of an idea. It was put together by a team of grad students at Darmstadt University in Germany. It assumes the existence of double sided, hinged, book like tablets, and it looks at a few of the ways that you might manipulate them. As you can see, the video demo doesn't use real devices. That's okay; I'm not sure they could be built. The concept assumes that the devices are both light enough and cheap enough that you can without concern for breaking them. This is the first time I've seen a mobile device that is manipulated through complex 3d motions, and that's probably because they lack the hardware. Do you know, the gadget that comes closest to this kind of interaction would be the Wii. It has 2 controllers with sensors complex enough that you could probably set them to trigger most of the behaviors shown above. I wonder if anyone has hacked the Wii controllers so they can manipulable a tablet based on how wave your arms around? That would be worth seeing. But when it comes to tablets, I'd say that the Entourage Edge came closest to the FoldMe. This deceased device had just the 2 screen, not 4, and it likely never would have copied FoldMe. The Edge cost too much and weighed too much for anyone to be comfortable flipping it round like that. In a few years, Apple will have an OS that will allow iPads to be placed next to each other and act as one. People’s need to share will make that inevitable. And business will find it useful too. No need to invent fancy hardware. This looks great. And while they’re at it, I’d like to have a device with a screen that can display both LCD and eInk – so you could switch between them and use whichever was most appropriate for the light where you were. Anyway, that’s my two cents.